It’s very disheartening to not realize your food has gone bad until after you have already started eating it. That first bite of the apple may have been fine but look out for that second one. It’s a shame when the moldy side of the bread lands on the inside of the sandwich. It’s hard to tell where that extra tang is coming from until you scream after taking a peek at what’s under the lid. Had this happen with beef jerky, once. Thankfully, I somehow managed to get a piece that didn’t have anything on it, since I didn’t notice the fuzzy bits inside the bag, until after I’d eaten that first piece. That could have gone badly, I’m allergic to penicillin. I may have just vomited a little. …they weren’t the patties with the cheese inside. Worse is the fact that the ‘Fur’ is the only part of mold you can see. If you see fur, all the rest of the yoghurt or marmalade is already overgrown with invisible mycellium. A quote from the once-popular sitcom Malcom in the Middle. One thing though, to an earlier commenter. Give him credit that he knew that it was a mold. Had a friend in college who loved his ‘science experiments’. He’d leave a partially eaten cake on top of the fridge (in one of those Tupperware cake containers) for months just to watch the molds change color over time. Needless to say I didn’t eat at his place very often. 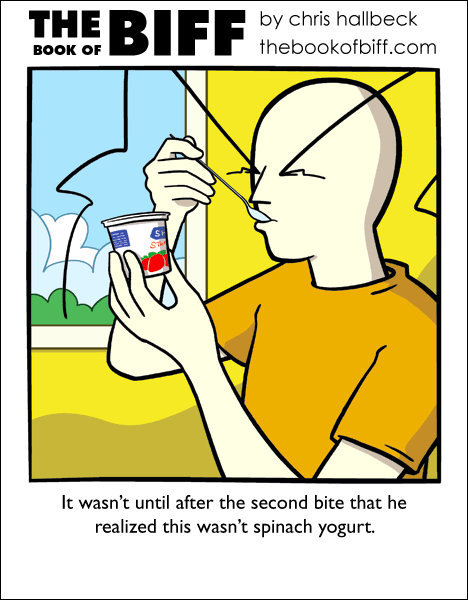 OK, I wanna know if Biff actually eats spinach yoghurt. Or maybe I DON’T wanna know. I think pretty much all yoghurt is nasty beyond belief, excepting some of the things the Indians and Greeks do to it, but by that time, it’s no longer really yoghurt – it’s a sour milk ingredient. OTOH, I have no problem with sour cream. Go figure. They still have them. Also hotdogs in the same style. Nasty; with or without fungus. @ZeoViolet: mycelium =/= penicillin. It’s the term for the structures in fungus. Ziriath was saying that by the time there’s fur on top, the rest of the yogurt is filled with threads of fungus that have grown throughout the entire container. That’s incredibly nauseating, yet somehow, I think biff is fine, I mean, what ELSE has be been through this year? Ahahaha. that reminds me of a story. one time when i was about 13, we just move3d to texas. my mom unloaded everything and put it in the cubboard. 2 weeks later we decide to have some kind of flat noodles for a side dish. i had already finished mine when my dad said, “hey, what kind of seasoning is on here? its rather big.” then my mom said “seasoning? i didn’ put an….. oh, dear.” It was then we realized there were pill bugs inside with the noodles. a LOT of pill bugs. that i had eaten. with my mouth. and teeth. and OH MY GO- BLAAAAAARGGGGHHHHHHH……….. Either way, it’s gross. Especially since yogurt is one of the few ways I can eat dairy. I was picturing what would happen if it were contaminated with a penicillium family mold. Gah. Hospital. (Severe penicillin allergy here). I once got halfway through some pre-packaged fruit smoothie only to discover it was expired. I started to feel a little funny and wondered if it was possible it had slightly fermented; it was either that or paranoia. Somethings wrong with my sense of smell. I tend to eat first and suffer the consequences later. Fortunately years of eating White Castle has toughened up my digestion muscles! …actually, this happened a lot to me with a particular brand of candy. It was very yummy, but for some reason it had an extremely short shelf-life, and it always went bad a couple of weeks before the “sell by” date… resulting in me buying it, chomping on it enthusiastically, and then realizing it had a bitter taste that really shouldn’t be there… cue gagging, spitting and horrified look into the package and the fuzzy contents. Oh prepackaged products…why do you tormet us so? I had this happen once with a can of Beefaroni. I’d never had it before and I thought the sauce looked a bit dark compared to the ravioli I was familiar with, but I assumed it was due to the presence of beef in the sauce instead of the pasta. …I have never been more ill in all my life. That was many a year ago, but just seeing the package still brings on a vague sense of nausea. I had a mold moment when I was drinking some sweet-not-so-iced-anymore-after-leaving-it-somewhere-for-more-than-a-week-and-not-realizing-that-it-wasn’t-a-fresh-bottle-because-all-the-water-bottles-I-put-my-drinks-in-look-the-same-tea. The bottle was clear, but there was no tell-tale green fuzz, just several barely visible clear lumps of slime… which I only noticed after swallowing one. Ker-bleh. I actually almost had a moment like this a night or two ago. I was making microwave quesadillas (aka taking tortillas and shredded cheese and combining, melting, and enjoying), and I was using the Swiss I had used the NIGHT BEFORE. I put the first layer down on the bottom tier, then on the top tier, I grabbed it (not looking in the bag), pulled it out and started to sprinkle it, until I saw blue falling down. then I took a look at my hand, saw blue, moldy swiss, and sighed because I was looking forward to swiss in it. I had to throw out the provolone and mozzarella that was already there just in case. Then I used the rest of those two to make it. Did you know cups of tea can go mouldy? My brother proved cups of tea can go mouldy. Also, leave an open jar of jam in a dark cupboard long enough and you’ll find yourself spreading some sort of fruit brandy on toast. That was an interesting experience. Aaaaand this is exactly why I refuse to eat anything that I can’t see while I’m eating it. Nothing directly from a carton or container that is opaque, nothing in a pitch-black room, and DEFINITELY not those awful, disgusting tube-yoghurts. I must inspect every bite for cleanliness before consumption. It’s one of the reasons I’m possibly the slowest eater I know. I love when people see the bread is moldy and tell me to “cut off the bad parts”. When something says “mystery flavor”, let your roommate have half. Wait 20 minutes before eating your half. In my house, when something edible has gone a little over its time, I would cut off the bad parts and eat the rest. If it was bad enough to make anyone else sick, my tummy will be rumbling for a few hours, and that is it.